Nearly half of women older than 50 say they are sometimes incontinent—a problem that can range from a minor nuisance to a major issue, according to a new poll. 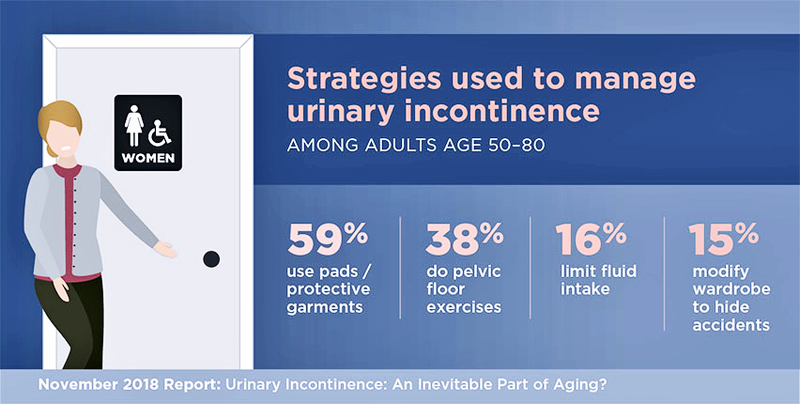 The new findings from the National Poll on Healthy Aging suggest that more physicians should routinely ask older female patients about incontinence issues. Swenson studies delivery of women’s health care, especially related to the pelvic floor—the structures and muscles that support the bladder and reproductive organs. There are non-surgical and surgical options for treating incontinence, she says. The most common triggers were coughing or sneezing—which 79 percent experienced—and trying to get to a bathroom in time, which 64 percent experienced. But 49 percent said they’d leaked when laughing, and 37 percent said it happens when they exercise. Women reported doing many things to cope with incontinence, but only 38 percent had done Kegel exercises, which involve squeezing and releasing the muscles of the pelvic floor. Such exercises can be an effective treatment when done correctly and consistently, especially as part of pelvic floor physical therapy with a specialized physical therapist. Among women who didn’t talk with their doctor about their urinary incontinence, 22 percent said they didn’t think of urine leakage as a health problem, so they didn’t discuss it with their doctor. But many treatment options now exist for urinary incontinence, Swenson says, and Medicare and private insurers routinely cover both medical and surgical treatments.